on the song "Danny Boy"
In celebration of the 100th anniversary of the song “Danny Boy,” here’s a tasty selection of “Danny Boy” recordings by some favorite artists. Please understand: This list is purely subjective as well as limited to songs that I can easily link to via YouTube. I’m making no claims that these are “the best.” I’m simply making a claim that: I like them! Judy Garland: I prefer this 1940 version to the showier version that Garland did in 1955, also available on YouTube. 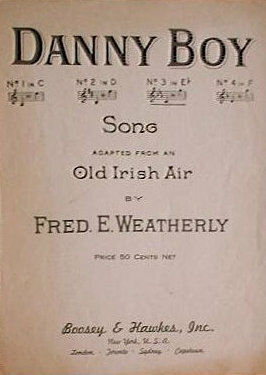 With “Danny Boy,” I tend to prefer the simpler versions, no frills needed. Paul Robeson: With a restrained piano accompaniment, Robeson’s sublime bass voice conveys great depths of meaning. Proof that men don’t have to be tenors to do “Danny Boy” right! Harry Belafonte: Taking his time, Belafonte’s mellow timbre lingers in the air as the last note fades. Performed at Carnegie Hall, it sounds more like he’s sharing the song privately one-on-one, perhaps comforting a loved one. Mahalia Jackson: Usually associated with gospel music, Jackson’s powerful voice searches each word for new shades of meaning. In her hands, “Danny Boy” sounds like it was meant to be a gospel song. The Pogues: You don’t need to be pitch perfect to do a classic “Danny Boy.” Shane MacGowan sounds like he’s lived it and that’s what counts. Frank Patterson: Of all these versions, this one sounds “most right” to me—an Irish tenor pouring his heart out in song. Pretty cool that it featured so memorably in Miller’s Crossing (1990), too! Judy Collins: Such a beautiful voice, singing a capella. I love the absolute silence in the hall until the waves of applause at the end. Johnny Cash: This is from near the end of Cash’s life, when he was making every word count. Sinead O’Connor: I slightly prefer this live version to O’Connor’s recorded one. On both, she includes a political last stanza that was inserted anonymously many years ago and has become something of a standard over time. Swedish Chef, Beaker, and Animal: “Moving right along, here are three gifted singers who have all kissed the Blarney Stone…” It’s the Leprechaun Brothers! Yes vote for Jackie. And only 10 years old at the time she recorded it. Thanks for the list..You really should listen the version of Nana Mouskuri..
Danny Boy is a favorite of mine. I listen to every version of it I can find. Frank Patterson tops my list of renditions of Danny Boy by a male, and Celtic Woman had been at the top of my list for females. But I bumped them from the top spot in favor of a singer who has sang Danny Boy only once. That's correct, only once, she had never performed it, until the day this recording was made. Not only that she has not performed it since that day. It was recorded as 1 of 19 songs to be considered for a then upcoming album. 14 of the 19 songs made it onto the album. 18 of the 19 made it onto the Deluxe Edition of the album. Danny Boy was the only song that did not make it onto that album, or any of her albums since then. IMHO in the years to come this rendition of Danny Boy will be judged by future music scholars to be A Masterpiece for the Ages. Listen to and marvel at the beauty, emotional power, and vocal artistry of this singer. And one more amazing fact, the singer was only 10 years old at the time she recorded this. Her name is Ms. Jacqueline Marie Evancho, her fans simple call her Jackie. Jackie Evancho was only ten, the true prodigy. Perhaps when older on her own, she'll record Celtic Classics. Does anyone know what CD/DVD this version by Celtic Woman is on? Diana Krall on The Chieftains Tears of Stone cd always makes me tear up. Michael Litwin has them all beat. His video has vanished. Where did it go? Casting Call for O Pioneers!